Ruby and Flora are grieving the loss of their parents who died in a car accident and in this next chapter of their lives, summer has arrived and they are moving to live with their grandmother, Min, in a small town in New England. 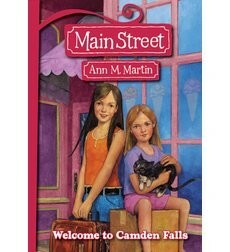 Min lives in one of the eight rowhouses on Aiken Avenue in Camden Falls and through the following chapters we meet the residents of the other rowhomes. New place, new people, no parents is a tough spot. But they've landed in a lovely town, filled with wholesome qualities and reassuring people. Their grandmother is the co-owner of a sewing store, Needle and Thread on Main street in the heart of this deeply rooted, caring place that still offers glimpses of the challenges the world can bring to each of us. As the story progresses, the sisters meet one by one a series of characters. There is the husband who is caring for his wife who has Alzheimer's Disease. There is the 17-year boy, Robbie, who has Down Syndrome. There is a girl whose father drinks too much. Everyone is going through something. Slowly the girls make friends and begin to feel they belong here...which is the underlying theme...along with the beautifully rendered sense of place...this is a place where you would want to live. All is well until a necklace goes missing and a young girl is suspected. Who is really doing the stealing?